Gigantic Fly. This 17" foam fly has a 27" wingspan! 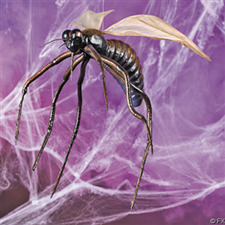 Each gigantic fly will cause quite a buzz at your Halloween bash! So realistic is this insect's legs and exoskeleton, that guests will start swatting at this spook! Hang him overhead buffet tables, entryways or light fixtures. Includes hanger.